The Local Government Online programme (LGOL) run between 2000 and 2005 provided the initial funds to enable councils to start exploiting the latest technology advancements and implement modern customer contact centres, online self-service capabilities and other new ways of interaction with their residents. However, after the significant budget cuts introduced after 2010, a period of austerity started that is still in place. Today councils face the challenge of finding new methods of working that can help them to provide a better quality of customer experience in a cost-efficient way. In this blog we discuss how using new intelligent technologies and digital tools, such as chatbots can help not only to reduce costs by enabling services on new, more cost-effective digital interaction channels, but also to improve the customer experience by adding convenience and enabling residents to interact with councils anytime, anywhere and via any device. Despite the penetration of digital channels and messaging apps, a massive percentage of customer inquiries are still handled over the phone. A large number of Contact Centres are still offering only voice and email as their preferred customer interaction channels; with very few of them starting to enable live chat on their website. Some customers have implemented voice self-service automation via IVR applications that are integrated to CRM and backend systems, such as ordering, payment, ticketing etc. This situation is typical for the majority of the companies we have traditionally provided Contact Centre services and solutions, and local government is not an exception. As stated in a previous blog3, the change in customer behaviour and expectations, driven by digital technologies is affecting not only private companies and businesses but also non-profit organisations and the public sector - including the way councils provide services to local residents. Chatbots provide an interface whereby a computer program can interact with users across a variety of digital touchpoints. When a chatbot is powered by Artificial Intelligence, e.g. cognitive services and machine learning, we call them intelligent chatbots. Intelligent chatbots can engage in a natural language conversation, identify objects in an image uploaded by the user, recognise a face, and connect with knowledge bases and other enterprise systems to extract the information requested by the user. It can also analyse in real-time the conversation and determine the sentiment of the customer, and much more. Geomant, along with its resellers and partners, has been providing contact centre technology to UK local authorities for almost two decades, ranging from voice-only to more advanced omnichannel solutions. The most frequent enquiries that residents turn to its local council is to find out about the next refuse collection day, to report a missed collection or to request a new bin. Geomant has implemented a number of automated voice self-service solutions for the above requirements using IVR platforms and advanced speech recognition technology. To meet the new customer expectations in the digital era, you can make the existing voice self-service capability available on new interaction channels, e.g. web chat as well as messaging applications such as Facebook Messenger or WhatsApp, or even intelligent agents such as Cortana and Amazon Alexa. All of the above is real and possible via an AI-powered conversational chatbot with natural language understanding capabilities that can recognise the user intent, e.g. This chatbot can reuse all the existing interfaces and backend integration logic that was previously developed for your voice application, preserving the investments already made in contact centre technology and self-service capabilities - saving time and money. A similar approach could be implemented for other services that are already available either via a voice self-service application or online via the council website. 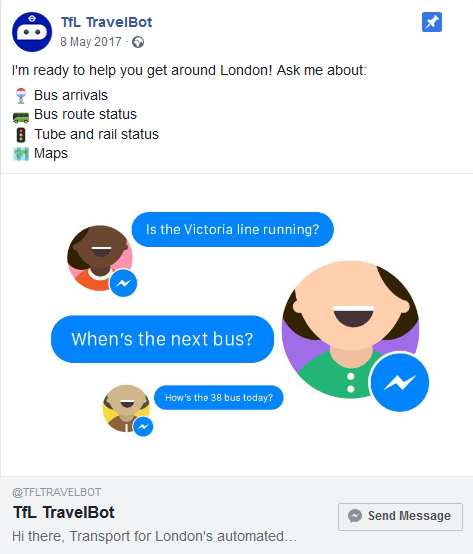 TfL TravelBot7 is an example of an intelligent chatbot that can "chat” with customers using Messenger and instantly tell them when their bus is due to arrive, provide service updates and Tube maps. The TravelBot can also link directly to a customer service agent, making customer service queries easier than ever. Geomant chatbots and AI solutions are a natural choice for councils looking to deliver superior customer service and experience in the digital era while keeping costs under control. For customers already using our multi-media contact centre solutions, it couldn’t be more easy to add an intelligent chatbot and instantly expand customer reach to messaging apps and mobile platforms. All of our bots support multiple customer interaction channels and can escalate any conversation to a live agent when and as needed, schedule a call-back and ask for customer feedback, giving you the ability to deliver effortless customer interaction at scale. Book a demo and see a Council Virtual Assistant in action! For almost two decades, Geomant has been helping companies to enable better customer service and effortless customer interactions. Building on our strong software development, integration and innovation heritage in contact centres and Unified Communications solutions, Geomant AI Practice is now assisting our partners and customers to step into and successfully manage the new journey of digital engagement and artificial intelligence.